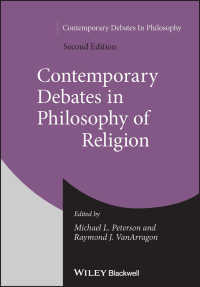 Building upon the reputation of the first edition, the extensively revised second edition of Contemporary Debates in Philosophy of Religion features fifteen essays which present arguments on some of the most central and controversial topics in philosophy of religion from the discipline’s most influential thinkers. Considering questions of both emerging and perennial interest from atheistic, theistic, and agnostic viewpoints, the book adopts the series structure which pairs essays espousing opposing perspectives on a particular question or theme in an engaging pro and con format. Following accessible introductions to each debate, the volume’s new and newly-revised contributions set the stage for thoughtful and lively discourse between philosophers in philosophy of religion and analytic theology. Debates range from vigorous disagreements between theists and their critics to arguments between theists of different philosophical and theological persuasions, highlighting points of contrast for readers while showcasing the field’s leading minds in dialogue. The head-to-head chapters offer forceful advocacy for some of the most compelling ideas, beliefs, and objections in the philosophy of religion, opening the conversation up to students to weigh the arguments and engage in comparative analysis of the concepts for themselves. Written to appeal to the non-specialist as well as the professional philosopher, Contemporary Debates in Philosophy of Religion is ideal as both a provocative primary text for coursework in analytical theology and philosophy of religion, and as a broad survey of the field for scholars and general readers with an interest in the questions which underpin contemporary philosophy of religion and theology. 1) Does the Universe have a Cause? 2) Is Fine-Tuning Evidence that God Exists? 3) Is God Necessary For Morality? 4) Does Religious Experience Justify Religious Belief? b) Negative Position: Do Mystics See God? 5) Does Testimony about Miracles Provide Evidence for Religion? 6) Is Evil Evidence against God’s Existence? 7) Does Divine Hiddenness Justify Atheism? 8) Does Science Discredit Religion? 9) Is the God of the Hebrew Bible Perfectly Good? 10) Is it Reasonable to Believe That Only One Religion is True? 11) Is Evidence Required for Religious Belief? 12) Should we Think of God as Masculine? a) Negative Position A: Is God a Man? 13) Does God Take Risks in Governing the World? 14) Should Christians Endorse Mind-Body Dualism? 15) Is Eternal Damnation Compatible with the Christian Concept of God?